Front man Todd Britton formed Analog Moon in 2005 while living in Columbia, SC. The band went through multiple line-up changes before Britton relocated to Asheville, NC, in 2008. While working on a follow-up to the band’s 2007 release, A.M. Radio, Britton teamed up with Asheville producer/musician Jon Ashley to begin recording the tracks that would later become Analog Moon’s second full-length album, Ascent and The Secret There Below. The sessions employed the talents of several local and regional musicians, such as Band of Horses keyboardist Ryan Monroe and Asheville jazz/bluegrass bassist and guitarist Barrett Smith. Britton and Ashley then assembled a live ensemble to perform tracks from the new album, as well as staples from the band’s existing catalog. That lineup consisted of Todd Britton on guitar, Jon Ashley on drums, former Archers of Loaf/Band of Horses bassist Matt Gentling on bass, and local music scene newcomer Josh Sullivan on keys with each member contributing vocals. 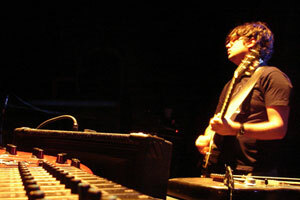 In 2013, Analog Moon shifted to a more electronic style, performing live with classic drum machine samples and synthesized bass while Britton and Sullivan concentrated on guitar and keys respectively. During this time, Britton wrote the collection of songs which would appear on IO, the band’s third full-length studio release. It would prove to be their most cohesive album to date.